I have this amazing friend that comes to town about once a year. When she comes, we always plan some sort of get together. Even if it is just the one night we get to see her. I have never painted with a group of friends before. In fact the last time I painted was college and I was 9 month pregnant. 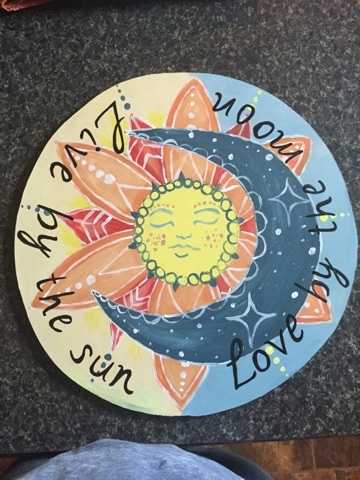 Because I am not good at following patterns or the rules when it comes to crafts and creating, I did not make the lemon slice that this circle MDF board was meant for. Instead I choose to use this quote that I saw on Pinterest. Live by the sun, Love by the moon. I don't know why but I loved it. Combine that with my love of henna designs and the idea for this painting was born. Now it's not perfect and I did stray from my original idea slightly, but I love it. I had forgotten how much I love to paint.